Mis-Design was an expansive, multi-layered project with exhibitions occupying the Ian Potter Museum of Art as well as off site venues such as the McDonald’s car park, Collingwood and Alphaville clothing store on Brunswick Street. Curated by Grace McQuilten, Mis-Design ‘maps the potential for critical artistic practice in an environment marked by the design of commodities…and examines the relationship between art and design within the context of the commodification of art’ With projects such as Shelter by the Slow Art Collective (Tony Adams, Chaco Kato, Ash Keating and Dylan Martorell), Adam Kalkin’s Tennis Academy and Andrea Zittel’s Smockshop Archive – a slow fashion affront to notions of trend and choice within the fashion industry – Mis-design was reclamation of both conceptual and visual spaces reinforcing art’s ability to confound and critique rather than being slowly ensconced within systems of commerce. Shelter was embedded within the Collingwood McDonald’s car park – a space that, like many car parks, is foreboding, dark and dank. As built environments, they are constructed purely for the encasement and storage of the tools we utilise to move from point A to point B. And the bland, pre-fabricated concrete panels that frame this site lack any sense of monumentality. It is pure function over form, built to service the fast food consumer culture that permeates our society. Rupturing this banal environment with its day-glow brightness, appropriated detritus and DIY aesthetic, Shelter read as an affront to its surroundings, its visual punch provoked a reaction in the spectator that was both unexpected and unnerving. The installation was situated in the bowels of the car park – underneath street level – on the central island of the in use drive thru lane. As a visitor, it felt like you had stumbled across a private domestic space made public. Documented and streamed live to the Ian Potter Museum of Art at the University of Melbourne, Shelter explored built spaces in their most rudimentary form, created out of necessity rather than want. Bright milk and bread crates, tin cans and reclaimed advertising placards were appropriated, emptied out of their original use value and haphazardly fashioned into a temporary shelter. Visual nods to food brands littered the space, from familiar packaging to bright logos – branded accoutrements to our food consumption laid bare. As part of the embedded criticism of the mistreatment and societal disregard for the homeless in the work, the Slow Art Collective empathetically attempted to create a space with a sense of homeliness. A ragged mannequin lay in bed within a roomed off section of the installation, with books on guerrilla gardening and the environment haphazardly strewn about. On opposite ends of the work, totem pole fountains referenced symbols of suburbia and festive fairy lit clusters of bamboo were awkwardly positioned in front of a faux table setting made up of empty bottles and servings of wheatgrass. As the soundtrack of drive thru orders echoed in the background, what became evident was that Shelter was a subversive insertion into the very site that fuelled its existence. It was a valuable and timely critique of contemporary consumption culture and the stratification and social disparities that it creates. The intermingling of art with commerce was also a conceptual layer in Adam Kalkin’s wonderfully interactive work Adam Kalkin’s Tennis Academy (AKTA). Where Shelter was a subversive insertion, Kalkin’s work was about the act of creating moments of internal reflection through physical acts. Resplendent with tennis paraphernalia, sports branding and fake turf, an artificial tennis sports-scape was set up in the Ian Potter, allowing participants to explore their own physicality within the museum. The academy was run by the amazingly intense (but lovely) ex-tennis professional Art Lockwood. As I warmed up with Art around the running track, he proceeded to tell me stories from his professional career. What emerged was a remarkable personal narrative, which framed the seismic shift of sport from an ultimate expression of the physical to a pursuit that is tainted by commercial interests. The participant’s experience of the work ultimately rested on the relationship that was formed with Art, however his ability to become entirely focussed on the physical act was infectious. Tennis drills – which ranged from hitting balls into a wall emblazoned with the word GOD, to tiring volleying – were juxtaposed with a cacophony of primal drumbeats and guttural bellows, effectively rendering the act of tennis as conduit for the exploration of self. This convergence of physicality with the primal, along with Art’s intriguing personal history, created a work which proved to be an emphatic counterpoint to the heavily designed capitalist symbols that emblazoned the walls of this faux tennis stadium. Like Shelter, what AKTA resoundingly achieved was an undermining of commerce’s incessant ability to entrench itself within our private and public spaces. Grace McQuilton, Mis-Design: Art in a Consumer Landscape, Ashgate publishing, Surrey England, 2011, p. 3. It’s safe to say that there’s been a recent love affair with Laksa in Melbourne. Heading into the depths of a Melbourne winter, its heady mixture of spices, coconut milk based broth, noodles and vegetables makes it the perfect dish to warm the heart along with the belly. Laksa King has been a key protagonist in this revolution, serving Laksa alongside other Malaysian favourites like Nasi Lemak and Hainanese chicken rice from its humble shopping centre arcade locale for 12 years now. Recently making the decision to move around the corner to Pin Oak Crescent, this Flemington stalwart has received a new lease on life with the help of Indonesian architect Vian Rosanto and local studio MNE architects. Now made up of large timber communal tables, pendants which hang languidly from the ceiling, along with some nice industrial touches like exposed brick and steel, it’s a kind of bustling south east Asian restaurant that acts as both favourite local and Melbourne institution. Featuring prominently on the menu is of course Laksa. Serving various incarnations, from the coconut milk based Curry Laksa (which also has a fish head and seafood option) to the distinctly fishy and tamarind based broth of Assam Laksa, it’s an eatery that is well adept at reinterpreting hawker classics. Sticky Pork Belly that combines beautifully tender slithers of belly and a star anise tinged sticky sauce, Char Kway Teow a flat rice fried noodle dish that represents all that is great about Asian street food and Sambal Kang Kong, a tangy chilli paste stir fried with water spinach are all standouts from a large and diverse menu. Dying In Spite of the Miraculous is a group exhibition which explores the various psychological states we inhabit and experience as our lives play out in their very own choreographed moments. It is an investigation of the real and the unknown, it seeks to elucidate how sites play an indelible role in informing our ways of being whilst also exploring the grey conceptual spaces that often emerge between the artist’s concept and the finished work. Curated by Emily Cormack, Alexie Glass-Kantor, Simon Maidment and Brett Sheehy and presented as part of the Melbourne International Arts Festival, this exhibition features the work of artists such as Ulla Von Brandenburg, Jeremy Blake and Meg O’Callaghan. As you enter Gertrude Contemporary, the front space is shrouded behind a wall of languid fabric draped elegantly from the ceiling. You make your way through this shroud, meandering precariously through visible pathways before stumbling upon the viewing space. It’s an unnerving experience that is mirrored in Ulla Von Brandenburg’s work Singspiel (2009). This video work – shot in black and white and displayed directly onto fabric – documents a selection of staged arbitrary human interactions and intimate moments within the surrounds of Le Corbusier’s Villa Savoy. The camera moves slowly and gracefully, using the hallways and rooms of the Villa Savoy as a character in its own right, informing and eavesdropping on each scene from the background. As spectator, you are drawn into these private moments, into scenes of supposed serenity, into realms of the personal which are exposed for all to see – you become aware that these misc en scenes are entirely choreographed with actors playing out pre-empted characters. Overlayed with haunting music which appears to be mimed by the characters in a stream of consciousness loop, this work is entirely unnerving – the vignettes appear to be woven into an elaborate reality, functioning on a plane between the real and allegory. From blurred realms between performance and the everyday to narratives of fictional fantasy juxtaposed against a backdrop of strange biomorphic hospital interiors, Saskia Olde Wolbers work Interloper (2003) continues this exhibition’s exploration of internal psychological states. Here Wolbers appropriates a narrative which details a doomed relationship between a doctor and a mistress. It is a tale that is haunting and ultimately about the lust for someone against better judgement, as the protagonist spirals further and further out of control. This tale – told by a hypnotic and mesmeric voice – is overlayed against imagery of a sterile white hospital. The interior landscape appears to melt away into the ether no longer resembling the sterile lifeless spaces that we are accustomed to. It is a beguiling backdrop, as glossy white blobs float off hard surfaces morphing into something new and entirely different. These surreal landscapes invite the viewer to peer into their own private worlds, questioning and interrogating the reality that surrounds them. Fantastical landscapes also featured prominently in O’Callaghan’s work To the End (2007), though this time on an immense scale. Windswept, desolate and harsh, the landscape is situated front and centre in this work as it dwarfs and eventually consumes the lonely male protagonist. Employing filmic techniques to illustrate his futile struggle to find identity in an exiled world, there is a sense of hopelessness that pervades in this video. Appearing as a spaceman in a barren landscape, O’Callaghan’s lonely explorer perilously teeters on the edge of being engulfed by the world that surrounds him – in one sequence he literally sinks into a bubbling bog – which can be read as a metaphor of nature’s predilection to both provide and take away life. Exploring human will and its unwavering search for meaning, O’Callaghan’s work is as much about the articulation of profound loss as it is a visual record of the poetics of place. More human in scale but nevertheless extending thematically on notions of loss, premonitions of failure and distress, Bas Jan Ader’s work I’m too sad to tell you (1971) adopts a first person perspective in displaying his own emotional journeys extremely close to the surface. In this work – which engenders a more intimate and personal experience for the viewer – Ader appears emotionally vulnerable as he becomes resigned to the anguish he faces. It is sadness that emanates slowly from within and it is an internal grief that that we can empathise with as he cries. As Cindy Loehr argued – when reviewing a retrospective of his work held at the UCR Sweeney gallery in California – Ader remained aware of his ultimate inability to express the sadness he found in the sublime. This failure, which may have deterred him, instead became the focus of his work. At its core, Dying in Spite of the Miraculous is an exhibition which beautifully navigated the grey spaces between the illusory and reality, between existence and the metaphysical as well as exploring the various psychological states that accompany loss and hopelessness. Also featuring Joachim Koester’s work Morning of the Magicians (2006) which displayed garden imagery in black and white silhouettes slowly morphing into a hallucinatory enveloping darkness and Jeremy Blake’s painterly digital animations which explored Sara Winchester’s gothic mansion ingeniously renovated to ward off the spirits of the people that were killed by Winchester firearms, this exhibition successfully brought to the surface the multitude of internal moments that are repressed in the human condition. As I stepped back onto the footpath on Gertrude St, my surroundings seemed to melt away into the ether as I became preoccupied with thoughts of my own existence – a moment of internal retrospection sparked by this profound exhibition. Gingerboy has been a beacon for palates afflicted by yellow fever for nearly five years now. Established by Teage Ezard as a sister restaurant to the flagship Ezard at Adelphi, Gingerboy has been dishing out refined but not too over worked South East Asian hawker style food since it opened in late 2006. With an identity created in collaboration with Studio Round and fit out by Elenberg Fraser, the space is one part chic and one part Shanghai opium den. Large red threaded chandeliers dominate dining room flowing languidly to disperse the ambient light, imbuing the space with a sense of the unknown. Juxtaposing Kartell/Starck Louis Ghost chairs with dark black tables and cladding the ceiling with a series of tactile bamboo poles provides it with a sleek but tactile edge. With a menu broken down into small plates and larger shared dishes, it’s immediately obvious that Gingerboy’s raison d’etre is framed around serving food that is packed full of flavour. The famous son in law eggs – a delectable mélange of textural elements and a dish that ultimately has its roots in Malay and Thai street food – is best eaten whole and in one mouthful. The smashed green papaya salad is a well handled balance of tangyness and heat and the crispy chilli salt cuttlefish is a dish of perfectly cooked morsels of what could best described as grown up snack food. Larger share plates include a vibrant red duck curry flecked with accents of Thai basil, a wonderfully pungent char grilled lemongrass chicken accompanied with a peanut and tamarind caramel and fried whole baby snapper with a fresh mango and lychee salad. These offerings definitely exhibit an approach to food that tends more towards the traditional infused with contemporary touches rather than being overly technical. For those more inclined towards sweeter things, Gingerboy also serves a delightful dessert share plate which perfectly references the sweet, salty and creamy offerings that could so easily be eaten on a roadside in Thailand. Northside Wheelers is a small but amazingly curated space that sticks out like a beacon amongst a bike store wasteland, drawing people from Melbourne’s vibrant cycling community and discerning customers who are searching for products that speak to them on multiple levels. 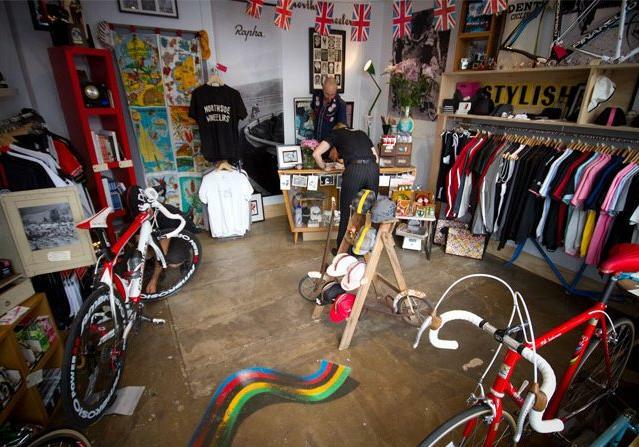 Actually located on Izzett St Prahran, unlike your glitzy local bike shop more focused on selling you day-glo lycra worn by so many along Beach road, Northside Wheelers is a purveyor of fine cycling wares. It’s a store where you’ll come across that lovely vintage Italian De Rosa steel frame sitting proudly in the window or that classic Ciocc bike that you yearned for when you first pedaled a contraption with two wheels. Owned by Malachi Moxon who divides his time between being a part-time, full-time cyclist and part-time retail raconteur, Northside Wheelers provides Melbourne with a refreshingly design-focused space to peruse products that reference cycling’s rich history. The only retailer in Melbourne to stock Rapha cycling wear, its new range of skincare (or embrocation to those who like their cycling with a European bent), along with a rack of beautiful vintage jerseys, caps and tables adorned with some of the finest cycling texts available, Northside Wheelers shuns established notions of what it means to be a bike shop and seeks to establish a tradition of its own. A visit to Cibi was not without expectation. This café, gift store and gallery space has received a series of rave reviews for its honest and delicate approach to food and its restrained but ultimately stylish interior – no doubt due to the owner Zenta Tanaka’s previous occupation as an architect. Clever little design touches and objects such as an old Apple Mac used as a doorstop and vintage road bike accent an interior that is more about the sum of its eclectic parts rather than a heavily stylised fit-out. With multiple seating options from large communal tables to vintage bench seats there are many ways to whittle away the hours with a cup of Romcaffe coffee in hand. Unsurprisingly Cibi has built up a reputation for its Japanese breakfast which is served only on Saturdays and for $14.50 appears excellent value. Made up of a homemade hearty miso soup with root vegetables, tofu and seaweed, followed by a delicately presented offering of rice, shiozake (salt cured grilled salmon), with sides of potato salad, mini slivers of cucumber and perfectly formed ovals of tamago (egg roll) it’s a great way to start the day. The vegetarian version comes with wonderfully warming simmered pumpkin nimono which satisfies due to its balance of saltiness and inherent sweetness. The other food on offer is also similarly light, with a beautiful soba noodle salad accented with cherry tomatoes and finely diced green olives bathed in a dashi and soy dressing, sourdough toast with a wonderfully mustardy potato and egg salad and a tofu burger topped with shiso leaf. The Japanese breakfast is based off Meg Tanaka’s grandmother’s recipe which makes Cibi a little slice of Tokyo in the quiet back streets of Collingwood. The notions of spectacle and stimulation are never far from the surface in a city like Tokyo. A literal megalopolis that sprawls out endlessly, its sheer scale, magnitude, bright lights and omnipresent city grime renders the individual almost lost and forgotten – enveloped by a city purely because it functions. This was the view from the observation deck that shared the same building as the Mori Art Museum. Unlike our antipodium public museum spaces, which are often housed in self-contained buildings, the Mori Art Museum is located on the fiftieth and fifty-first floors of the Mori tower which is part of the larger Roppongi Hills complex. As you enter the museum you are taken up an escalator with a gleaming chandelier hanging above you illuminating the foyer – pure spectacle in itself. In this regard, Ai Wei Wei’s exhibition According to What? with its combination of large scale interdisciplinary works and smaller sculptural objects inhabited the voluminous spaces of the Mori Art Museum with an overall sense of coherence and purpose. It is easy to view Ai as the agent provocateur of mainland Chinese art perhaps due to his other life as a dedicated political activist – situating his oeuvre on a plane that acts purely as a political affront or subversive statement against the policies of the Chinese government. Certainly some of his work has a political edge by virtue of it commenting on and critiquing these social policies, however to position his work as inherently political may be overly one-dimensional and simplistic. Ai’s works are as much about the process of exploring of history, form as well as the exploration of the self within a rapidly shifting social context. The exhibition was divided into three main sections: “Fundamental Forms and Volumes,” “Structure and Craftsmanship” and “Reforming and Inheriting Tradition”. In the first space, the viewer is exposed to several works which examine the use of traditional everyday materials appropriated to create modernist geometric forms. In works such as Ton of Tea 2006, oolong tea is compacted together to form a perfectly shaped cubic metre block. It stood quietly in the middle of the space – static and aesthetically resolved acting as an exploration of space and form. The use of organic materials such as Huali wood in Cubic Metre Tables 2006 and tea provided the works with a textural quality that reminded the viewer of the process driven nature of Ai’s work. At the rear of the first gallery space, Teahouse 2009 filled an entire sectioned off void. Solid blocks of compacted tea fashioned into brick-like shapes are stacked on top of each other to form a small house that sat on a bed of loose tea leaves. The loose tea appeared to spew out of the house, completely colonising the space, reaching out to the viewer as a gesture of connection between the interior space and the external unknown. Consequently the volume of the house metaphorically expands pasts its rigid shape and is emptied out of its intended use value, signifying the relationship of this ingredient to the customs of social interaction and everyday life. The notions of everyday life and societal transformations are always embedded into Ai’s work. In a separate space the work Provisional Landscapes 2002-2008 was created using a large series of photographs that wrapped around all four walls, enveloping the viewer’s field of vision due to the sheer scale of imagery. Individual shots displayed a myriad of urban landscapes in China, some documenting the concrete rubble after a demolition, some the gigantic equipment used to create new apartment buildings, some the finished result – a series of gleaming towers amidst a sea of rubble. A visual timeline of China’s rapid urbanisation at all costs, this work displayed the before and after in all its glory. There were other works in the exhibition that critiqued China’s commercialisation such as Forever Bicycles 2003 and Coca Cola Vase 1997, where a fourteen hundred year old vase from the Tang dynasty has been emblazoned with the Coca Cola logo. However, the imagery in Provisional Landscapes is tinged with a sense of the unknowing and sadness, foregrounding the multiple layers of society that drastic urban change touches – it is an arresting and profound work. There were works that struggled to articulate the complex layers that are embedded into the experiences of life in China such as Snake Ceiling 2008 – which was a serpent like form that was suspended up high above you on the ceiling. Made out of brightly coloured backpacks that were connected together, the bags acted as the building blocks of the serpent’s languid body – its form referencing the use of serpent imagery as a symbolic representation of evil and taker of life in Chinese mythology. This collection of backpacks was also a visual reference to the number of people that perished in the Sichuan earthquake of 2008, in this case appearing literally to be swallowed up by the snake. However the work felt ill conceived and unconsidered, lacking the restraint and subtlety needed to engage with such an issue, sitting awkwardly in the space that it was hung in. Disrupting the conceptual flow of the exhibition it appeared almost as an artistic contrivance – the act of remembrance and commemoration faded into the background, as the statement and the visual were embraced. Whilst some of the large-scale sculptural works and the video work Chang An Boulevard 2008 had a discursive quality that sat uncomfortably aside the more conceptually coherent works, as an exploration into Ai’s oeuvre, this exhibition successfully provided the viewer with insights into the social and cultural contexts from which his works are created. Ai’s works are always bound to an experience, to a time and a place in history and the reconfiguring of established art histories. In a city like Tokyo where efficiency and hyper-modernity are intertwined with the historical, this exhibition felt entirely at home.